One of last year's best gaming surprises was Danganronpa, a twisted series of mysteries that involve high school students, murder mysteries, and a talking stuffed bear. Danganronpa and its sequel, Goodbye Despair, came out of nowhere to become two of my favorite games of 2014. 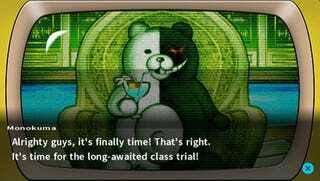 With news that the spinoff, Danganronpa: Another Episode, will come to North America this fall, and that the folks behind the series are currently working on Danganronpa 3, the future looks bright for anyone who's into sadistic Ursidae. Publisher NIS America helped us set up a brief e-mail interview with Danganronpa writer Kodaka Kazutaka, and although he didn't share too much about the future of the series, he did have some interesting things to say. You can read the whole Q&A below. SPOILER WARNING: This interview contains plot details from the first two Danganronpa games. Schreier: The first two Danganronpa games were visual novels, but Another Episode is more of an action game. What made you decide to pursue this kind of design for the spinoff? Kazutaka: It's really simple. I really wanted to make an actual action game this time and so they gave me free reign to do so. Schreier: Fans of the first two Danganronpa games might be hesitant about Another Episode because it's a spinoff action game — how would you convince Danganronpa fans to play this one, too? Kazutaka: Actually there was a similar issue with this in Japan. Most of the fans that played the first two Danganronpas mostly played visual novels because that's what they wanted to play. When we added the action elements, they got worried and thought "can I actually play it?" So the way we overcame that problem is by allowing the player to switch between Komaru and Genocide Jack. Playing as Genocide Jack should help players who might not be so good at action games. In terms of story and gameplay balance, it's really 50/50. There's a lot of story and the story is just as much of a focal point of the game as the action sequences themselves. And for those who aren't very good at action games, if you use Genocide Jack you will be able to get through the game a lot easier and get to the story points you want to see. Schreier: Tell me about what it's like to write a Danganronpa story. Do you start with the main mystery and then work from there? What's your process like? Kazutaka: Basically speaking, the story, the characters, and the gameplay are thought of, developed, and written concurrently. However, probably within that, the one that I pay the most attention to and give the most focus to is the characters, making sure they're really well written and well done. Schreier: Monokuma is one of my favorite video game characters... where did he come from? What was the inspiration behind the most horrifying bear in video games? Kazutaka: It's simpler than you might think: we're talking about crimes in murder mysteries and in Japanese there's what's called "kuro" and "shiro." Kuro means black and shiro means white. And kuro is guilty while shiro is the innocent. In that way, we wanted to incorporate that visually, which is where the black and white comes from. And bears are cute… so why not? Schreier: In Danganronpa, we're told that Monokuma was controlled by Junko, but the end strongly suggests that he can think and act for himself. In the second game, all we see is the virtual reality, so Monokuma could just be part of the virus. In the real world, does Monokuma have independent thought? Is he an AI? Kazutaka: The truth of the matter is that by the end of the first game, it's essentially Junko's virus that's controlling Monokuma. And then also in 2, it's the same thing. It's the virus taking control and making Monokuma move and work. Schreier: It always seems like there's a lady character designed to be the player's (and main character's) favorite — Kyoko in the first game, then Chiaki in the second. Is that intentional? Were those your favorite cast members too? Kazutaka: For number one, I didn't really specifically think of any female characters as the heroine. In regards to Kyoko Kirigiri specifically, it was just the idea that she was a detective and she had a good thought process that drove her to be perceived in that role for the player. On the other hand, wanting to specifically create a heroine is what drove Chiaki's creation. Schreier: Would you ever make a Danganronpa game with a female main character? Kazutaka: Honestly, I don't really think much of the gender of the character when I'm making the main characters. Schreier: How do you envision the future of Danganronpa? Would you like to create more visual novels in the series? What do you think they'd look like? Kazutaka: Basically speaking, every game that comes along is what I feel like making at the time. For example, in the middle of creating Danganronpa 2, I realized I wanted to make an action game, and so the next one, even though two still ended up being a visual novel, that action game came out as Danganronpa Another Episode: Ultra Despair Girls. I want to make sure the series itself is viable for any manner of storytelling. Once I feel like the story has been told, that will be the end of it. But as far as the team goes, as long as our team and I still have good stories to tell, we will continue. Schreier: After Danganronpa 2, it feels like the Junko plot is mostly resolved — will she continue to be the antagonist in future Danganronpa games, or do you think we're done with the Ultimate Despair? Kazutaka: Rather than saying anything about that, I'd rather that everybody plays the games to see what happens.